The stories about the miracles of Jesus are familiar to many—turning water into wine, feeding the 5,000, and the healing of a blind man. But have you ever stopped to think about what else was going on behind the scenes of each miraculous event—perhaps the miracle behind the miracle? 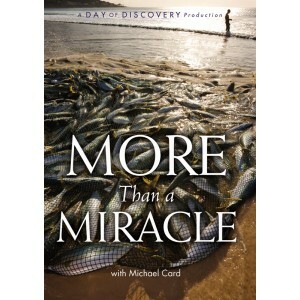 Join Michael Card in this Day of Discovery DVD, as he travels through the land of the Bible to recapture and explore afresh some of the miracles of Jesus. Journey to Nazareth, Cana, Capernaum, and Jerusalem, and walk along the shores of the Sea of Galilee. Experience the places where Jesus fed the multitudes and where He sought solitude. Gain fresh insights and new perspectives to extend your view beyond the miracles of Jesus and into the character and heart of God.